the Bear Blog: Still Shopping?? 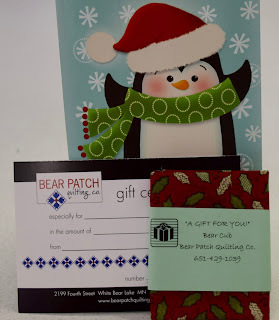 Another excellent gift choice is something simple and basic--quality thread! To the untrained eye, our little box of Aurifil thread might seem unimportant. Not so! This little assortment is like a treasure chest to many of us! These colors shown were chosen to compliment the 2016 Quilt Minnesota fabrics, and we still have some of those pieces left. 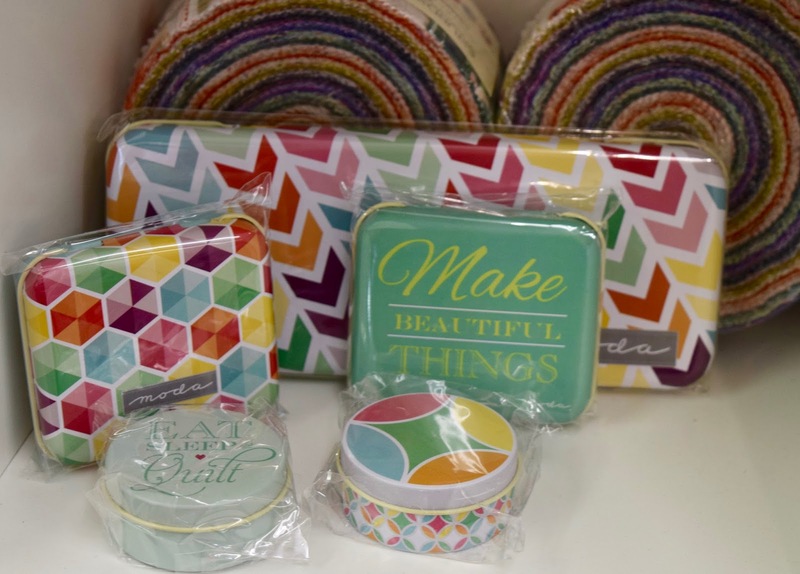 Just imagine how impressive it would be to gift a bundle of those fat quarters along with the thread box! 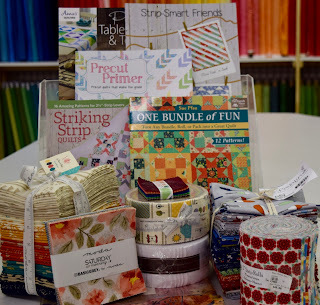 The price on the thread and box is $30, and fat quarters can be added for $2.50 each. Here's a treasure chest of a different sort - a collection of beautiful and useful scissors from . They are packaged in a special velvet lined wooden box. Several of these scissors have distinct and unique uses, and probably not something everyone already owns. $79.99 brings a lot of fine shine to the sewing room! Have you seen the light? The Slimline Light? This is a fabulous new LED table light that I can truthfully say is now a necessity in my sewing room! It illuminates either my sewing area or my cutting area, depending on which way I turn it. It's clamped to the counter top, but an additional round weighted base could be purchased. The light is $180 and the optional base is $43. Aging eyes will say "thank you"! We do love our tote bags and project bags in many shapes and sizes, why not tote in style with one of our Bear Patch bags! Those pictured range in price from $17.50 to $25.00. 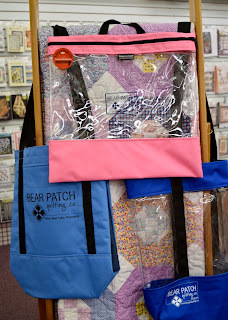 Better yet, give the gift of a bag filled with fabric! A lot of times, we have customers who want to present a gift that looks and feels like a real live quilt! Here's a very easy answer that doesn't involve a lot of time and effort for either the gifter or the giftee-- the Jelly Jive pattern ($3.50) plus a strip roll ($38-$44 each) plus fabric for binding and backing if you choose to include that. We have made this pattern numerous times and it's a great couch quilt size (50" x 59 1/2"). 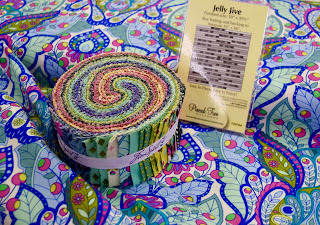 We have a large assortment of strip rolls for you to choose from, this is one of the brighter choices, but there are many others. Looking for a stocking stuffer? These pretty little tins are both useful and decorative. Even better when they are filled with needles, pins, clips, M&M's, etc! Another good idea -- take advantage of some of the pre-cuts we have in stock packaged with a book of patterns to use those pre-cuts! Pre-cuts come to us from the fabric companies cut in some standard sizes. They are coordinated sets from a designer group of fabrics, and are die-cut and packaged for us. That makes it so easy for you to use! Of course, you can always play it safe and get the gift that pleases all! Our gift cards can be written for any amount you choose, they never expire, and the balance can be carried forward until it is used up. Load it up with a good chunk of change and see the smiles on Christmas day! 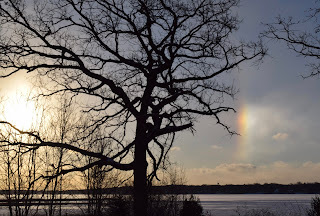 And finally, a frozen rainbow over White Bear Lake this morning--not for sale because it's priceless! Don't wait too long for your shopping, we are closed on Christmas Eve Day so we don't want any disappointed husbands knocking on the door on the 24th! We are open regular hours between now and then (Mon-Wed 9-9, Thur-Sat 9-5, Sunday 12-4). 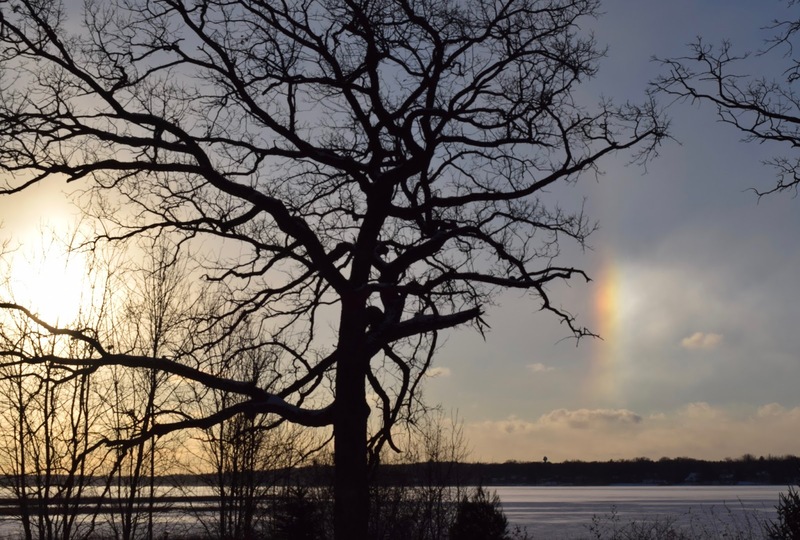 Call us at 651-429-1039 if you have any questions.